We all procrastinate from time to time and struggle to get things done. For years, much of the dialogue around procrastination has been about how to fight it and, theoretically, win. However, that approach has left a whole lot of us—included me—feeling pretty pathetic when we just can’t kick the habit. Turns out, we’ve been duped. For the last several years, experts have made in transforming procrastination from an evil that must be vanquished to a tool worth embracing in all its paradoxical and oxymoronic glory. Let me introduce you to productive procrastination. I almost giggle when I say it because it feels like I’m getting away with something very bad. However, when you learn a bit and start to incorporate productive procrastination into your life, it’s far from naughty—it’s so nice. Procrastination can help you clarify your goals, remove unnecessary tasks, and be more creative. But you can go beyond that. 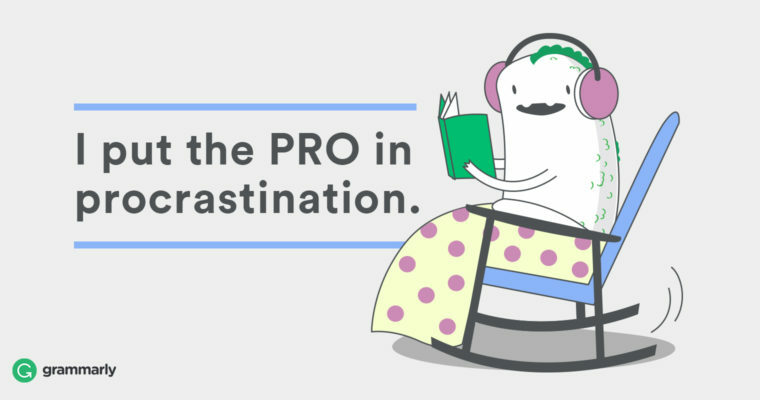 Here are a few indulgent ways you can get more (productive) procrastination into your life. 1 Become an active procrastinator. The main idea here is that you learn to pit your tasks against each other so that in procrastinating on one, you actually accomplish a lot of others. This can mean structuring to do lists so that your bigger, more vague tasks are at the top, but the actual work you need to do that day is somewhere lower down. Or just allow yourself to do something else as long as that something else isn’t binge-watching Netflix/scrolling through Facebook/pick your poison. Judging by Chandler’s output, it seems you’ll get a lot done just to avoid boredom. Lifehack put together a pretty good , but one item on their list deserves special attention—organization. In all its forms, organization can be simple and makes life easier. There’s also a short feedback loop so you feel good about what you’ve accomplished. (, anyone?) The best part is that organization can be for the task you actually need to do, and it doesn’t need to be particularly coherent (yet). For example, organizing your desk before writing or creating a blog to-do list—rather than writing the blog—can move you in the right direction but scratch your procrastination itch. So, let go of some of the guilt and embrace active, productive procrastination as a way to get more done. Are you a procrastinator? What are some ways that you “productively procrastinate”?